Two notes before this week’s screening log! 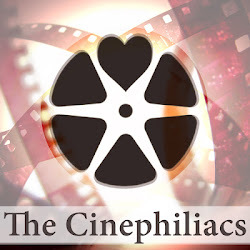 Today begins the For the Love of Film: The Film Preservation Blogathon. Run by Ferdy on Films, Rod Stewart, and the lovely Self-Styled Siren, this year’s goal is to raise $15,000 to donate to the National Film Preservation Foundation, who will use that money to restore the recently found Hitchcock film The White Shadow. Read more about it at Ferdy’s place, and donate here. Yours truly will have a couple of things to blog about later this week. Also, as I posted Friday, make sure to check out some of the great stuff at the Migrating Forms festival. -Celine and Julie Go Boating, 1977. Directed by Jacques Rivette. 35mm projection at Film Forum. -The Connection, 1961. Directed by Shirley Clarke. 35mm projection at IFC Center. The comedy Celine and Julie Go Boating begins with a chase. One woman, reading a book on magic, spots that another woman drops her glasses. She run after her, but the woman refuses to stop, dropping more objects along the way. Soon enough, the second woman is doing everything she possibly can to avoid the first, moving all across Paris. Do these two women know each other? Does it matter? The sequence become more and more bizarre. The stakes are pointless, but there is a delight in the process, and the fact we have no idea how this chase will end. 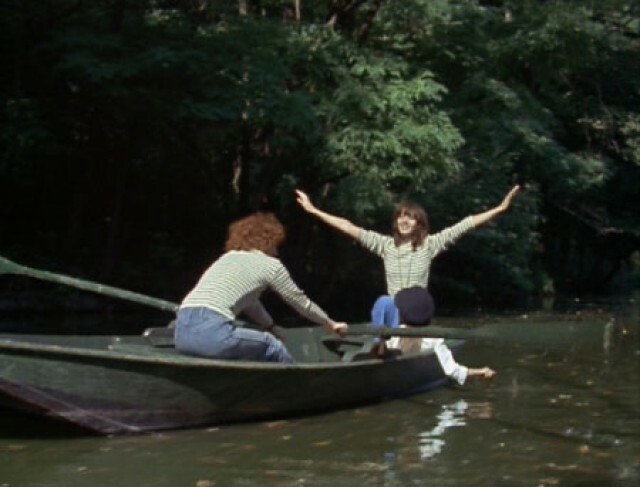 I have somehow managed to avoid any films by Jacques Rivette until last week, but seeing the three hour masterwork that is Celine and Julie Go Boating has thankfully ended this curse. The word magic doesn’t just apply to some of the narrative plot points that populate this film; it applies to the sense you get throughout the film. Anything can happen and will happen. Smiles become contagious, even as the narrative becomes completely illogical. But the film isn’t illogical, it simply follows it’s own logic, which is that real logic is silly. The two women are of course the titular Celine and Julie—each more odd than the next. Celine is a magician, whose show is less magic and perhaps a little more peep show. Julie is a librarian, but has her own interests in magic and the bizarre. The two women begin living with each other, and soon enough swap each other’s lives. Why? Why not, Rivette suggests. To question is simply silly. And it’s not like things would go so different. Rivette’s film has a sense of not pure improvisation, but that narrative happens because something just happened to walk by the set, and the girls decided to add it into the narrative. Dolls and objects (and candy!) 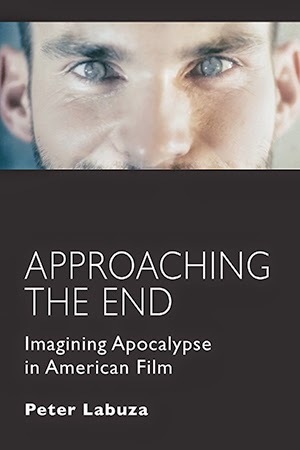 become essential, especially during the film’s second half, which has the duo inserting themselves into a turn-of-the century murder mystery at an aristocratic home. 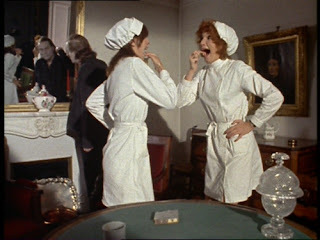 Julie and Celine takes turns playing the role of the nurse maid, slowly pulling the pieces together of what did what to who. And soon enough, both girls enter the narrative at the same time, cracking jokes at the expense of the characters (who never deviate from their standard procedure) and solving the murder and changing the ending. At three and a half hours long, I was worried around the time about halfway through Celine and Julie that the film would meander without purpose. But as the narrative picks up and sends us through this repeated tale, I could not wipe the smile from my face. Rivette’s camera work isn’t as flashy as much as it is casual, pretty much ignoring the fact that so many strange things are happening around him. Celine and Julie never seem to realize that they are dealing with magic and people who are essentially mad, but Dominique Labourier and Juliet Berto (who helped “write” the nonexistent script) play everything with such curiosity and inspiration that the film’s sense of the mundane is also its secret weapon. It’s not surprise Celine and Julie and Rivettte has often been lauded by those who other lauds—the film is another in the ranks of meta-commentaries on how we watch and view cinema (at one point during their mutual dream, Celine suggests they have an intermission). But most films about filmmaking or spectatorship insist on some strong important statement about the nature of artists and their supports, which is what Rivette avoids without even considering it. No one on this film is considering something “important.” They’re all having too much fun. Clover! *Interesting in that the fact I expected to see the film in digital, as it was shot on the format. FilmLinc had advertized what is called a digibeta (I believe not as strong as a scan as a DCP), but must’ve found a 35mm instead. It still looked gorgeous.